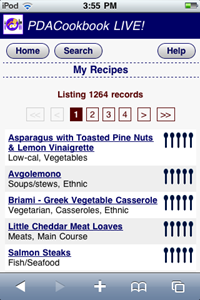 Recipe Cookbook Software for iPhone, Android, Blackberry, WebOS, Windows Phone 7 - PDACookbook LIVE! PDACookbook LIVE! is here for iPhone, Android, Blackberry, and Windows Phone users. Read about PDACookbook LIVE! We now have a version called PDACookbook LIVE! This version was designed for iPhone, Blackberry, Android, Windows Phone, and other smartphone users with an internet connection. This version also works on PC and Mac desktops. If you have any of these, please read about PDACookbook LIVE! If you have an older Palm OS or Windows Mobile device that does not have an internet connection, you can still use our older PDACookbook Plus version that installs on your PC and device. 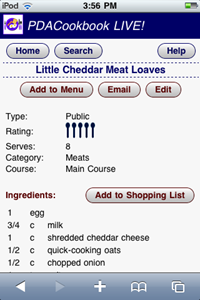 Read about PDACookbook Plus. Any other phone (with data connection) LIVE!